The Weathering Magazine is the only magazine devoted entirely to painting techniques and the ageing of scale models and figures. In this issue, we focus on subjects that for various reasons, are in service of owners other than the original. We will explore the unique aspects of applying the new paint schemes and symbols, learn to represent the wear and the passage of time on both factory and hastily repainted camouflage. 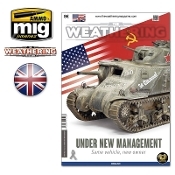 The Weathering Magazine explains all painting and weathering with detailed "step-by-step" articles, showing how to perform each technique as illustrated through high-quality images and concise descriptions from some of the world's best modelers. This eagerly awaited new issue of TWM is sure to be a collector's favorite, each page filled with useful techniques and each subject a great source of inspiration for all modelers.